I was really surprised with this one..happily so! 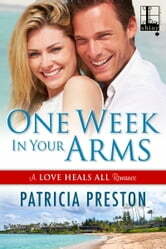 Patricia Preston is a new to me author but she definitely hooked me with this one! It's a secret child story that grabbed my attention right from the start. Marla Grant and Carson Blackwell had a fling six years ago and as they had agreed they both walked away when their time was over. Neither has forgotten the other though so when Carson discovers that the clinic Marla works for depends on donations from his Grandmother's foundation, he knows he needs to see her again and that's just the hook he needs. Promising to continue the funding in exchange for a week in Hawaii with him Marla knows she can't say no. She just needs to make sure her secret stays just that ...hers. A great read you don't want to miss. I highly recommend it. A sweet second chances romance, One Week in Your Arms tells the story of lovers who threw themselves into an affair without considering the long term implications. They didn't think there would be any. However, Carson couldn't forget Marla and kept hankering back to the one that got away. When circumstances bring them back together again, they find the same magic they first experienced with each other. However, there are now complications and they are facing grown up problems. This is an enjoyable romance that flows smoothly with good use of words, which makes it a pleasurable experience for the reader. I just adore stories of second chances that make you smile, feel good all over and pull you in from the first page. Ones with over powering men who know what they want and will do anything to get. Men who need to be taught a lesson or must learn from their mistakes with women who know how to stand on their own but really deep down just want that someone who keeps them smiling, with arms to fall into when the day is long, taking some of the hard times turning them around making you see a rainbow through the rain. I found all this and more in this story full of hope, love, fear, the unknown, misunderstandings, starting over, with humor, sorrow in community that gives back from a very talented author that gives you a story about family values, mistakes, love, longing and family. Yes it is a little predictable with a few surprises but it makes you smile and keeps you invested throughout the read. Marla and Carson had a hot love affair things didn’t go as planned, they split up and tried to move on. Neither could forget the other. When the opportunity knocked on Carson’s door he put a plan together to worm his way back into her life. He thinks one week is all he will need to work her out of his system. Come hell or high water one week it will be in Hawaii with Marla being his fake girlfriend. He’ll gets some hot nights in the sun with his hot ex, she gets the money she needs to run her clinic it is a win, win for both of them or is it? Marla fears of the unknown when and if Carson finds out about their daughter are true fears that any mother would feel. Fear has a way of making us do or say things we wouldn’t normal do. There were times I really wanted Marla to go ahead and get it over with but at the same time being a mother myself I understood why she didn’t and most likely would have done the same thing. With passion running high for them both something has to give and things must be worked out if they ever hope to have a HAE. I thought the author brought real emotions into the story pulling very strong on the reader’s heartstrings. With very emotional issue that was written with love and care twisting and turning not only to the story but the reader’s heart as well. It’s very well written giving a believable story that at times really broke my heart. I feel the supporting characters really added a lot to the story giving a very well round read. I found myself so invested I read this at one setting really wanting the story to not end. I would have liked to have seen more into their future I just wanted to continue reading with no ending in sight. I have not read anything by this author but really look forward to reading more of her work. If you just want a feel good read full of emotion, chemistry of a love that never ended even when goodbyes were said that pulls you in giving you sorrow, humor, smiles heartbreak and a love that last through the years I hope you will give this story a read. I really enjoy it so much.